Tickets are on sale now for Hadestown at the Walter Kerr Theatre on Broadway. Hadestown is a genre-defying adaptation of the ancient Greek myth of Orpheus and Eurydice that has journeyed far and wide and is ready to transform the Walter Kerr Theatre into the enticingly seductive underworld. The stage musical began its life in the mind of celebrated singer-songwriter Anaïs Mitchell, who would eventually turn her idea into a 2010 folk opera concept album. However, songs from the album were performed in her native state of Vermont several times back in 2006 and 2007 as a kind of “D.I.Y. theatre project,” as the singer herself described it. Its current form began to take shape after Mitchell approached Tony Award-nominated director Rachel Chavkin in 2012 following a visit to Chavkin’s ground-breaking production of immersive musical Natasha, Pierre and the Great Comet of 1812. Together the pair co-developed the stage musical with Mitchell adding 15 new songs and additional dialogue to fill the gaps in the story line and allow deeper characterizations. Finally, Hadestown was ready to stage its world premiere in May 2016, courtesy of Off-Broadway's New York Theatre Workshop, and huge critical acclaim and audience reactions meant the run was extended to the end of July 2016. The production was also rewarded with a Drama Desk nomination in the category of “Outstanding Musical” in 2017, along with no less than seven Lucille Lortel Award nominations. Hadestown’s journey to Broadway would take two important detours with a Canadian premiere at Edmonton’s Citadel Theatre in November 2017, followed by a UK premiere at London's National Theatre from November 2018 through to January 2019. And it was during its acclaimed run in London that a Broadway transfer was officially confirmed, beginning performances at the Walter Kerr Theatre on March 22, 2019, ahead of an official opening on April 17. This “Road to Hell” may have been a long and winding one that has taken Mitchell and Chavkin over a decade to walk, but we’re sure you’ll agree that the theatrical outcome is heavenly! Hadestown follows songwriter Orpheus and his mythical quest to overcome Hades and regain the favor of his one true love, Eurydice. Celebrated singer-songwriter Anaïs Mitchell’s mesmerizing melodies and poetic imagination pit nature against industry, faith against doubt, and love against fear in this genre-defying new work that blends modern American folk music with vintage New Orleans jazz to reimagine a sweeping ancient tale. The "Road to Hell" begins tonight... The Broadway premiere of singer-songwriter Anaïs Mitchell's celebrated folk opera Hadestown begin previews at the Walter Kerr Theatre tonight, ahead of an official opening on April 17. The "Road to Hell" begins... Producers of singer-songwriter Anaïs Mitchell's celebrated folk opera Hadestown confirmed complete casting today as rehearsals begin in preparation for the Broadway premiere. 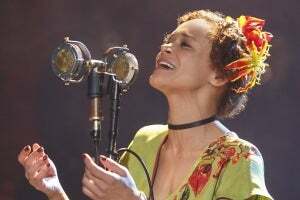 Having just finished their acclaimed run at London's National Theatre this past Saturday, January 26, the principal London cast will now reprise their respective roles for the previously announced Broadway premiere of singer-songwriter Anaïs Mitchell's celebrated folk opera Hadestown, it has been announced. The principal cast includes Reeve Carney (as Orpheus), 2-time Tony Award nominee André De Shields (as Hermes), Amber Gray (as Persephone), Tony Award nominee Eva Noblezada (as Eurydice), and Patrick Page (as Hades). 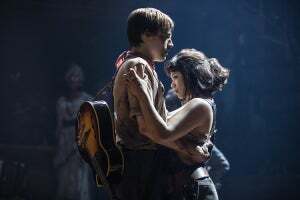 Currently wowing British theatregoers at London's National Theatre (until January 26, 2019), further details have now been revealed for the eagerly-awaited Broadway transfer of singer-songwriter Anaïs Mitchell's acclaimed folk opera Hadestown. The Broadway production will begin previews at the Walter Kerr Theatre on March 22, 2019, ahead of an official opening on April 17. Casting for the Broadway transfer will be announced shortly.